I’ll get straight to the point. 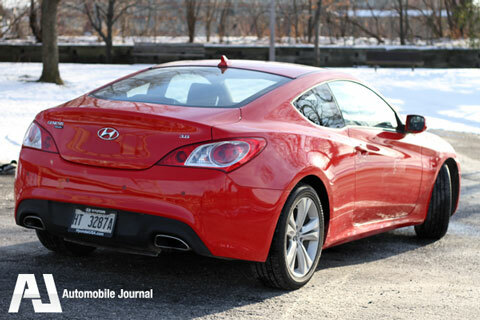 Hyundai’s Genesis coupe is a formidable competitor in the modern day muscle car wars. In fact, in my view, it not only holds its own among Chevy’s Camaro, Ford’s Mustang and Dodge’s Challenger, it does so while carving out a nice little market niche for itself: the high performance sports coupe for those who don’t give a whit about tradition, retro influences or V-8 engines which are so yesteryear to many in the young crowd. And if you buy it with the 306 horsepower V-6, you’d better hang on tight. Never you mind that there’s not a V-8 under the hood. That deep, throaty growl from the exhaust is backed up by strong acceleration that will get you to 60 in less than six seconds with no fuss, no muss. Prices range from $22,000 for the base 2.0 T with a six speed to $32,000 for the rear wheel drive (all Genesis coupes are rear wheel drive, by the way) 3.8 Track with Navigation model. Our 3.8 Grand Touring model with navigation was plenty nice, with a starting price of $28,500, and about $30,000 equipped as ours was. 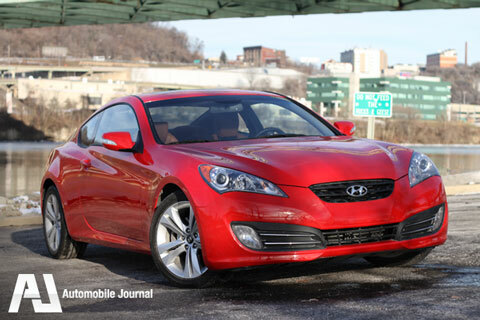 Of course, Hyundai’s game is value, and the Genesis Coupe comes with plenty of that. Even the base model has full power accessories, tilt steering wheel, air, a CD/MP3 player, and cruise control. Along with Bluetooth, stability control, antilock brakes, side curtain air bags and a host of other equipment. The base engine is a 210 horsepower, 2.09 liter turbocharged four cylinder power plant that you can expect around 21/30 miles per gallon. By the time you get to the top of the line 3.8 Grand Touring, you’ve added fog lights, chrome front fascia accents, automatic climate control, xenon headlamps, rear parking sensors heated mirrors, and an Infinity audio system. A word about the sound system: It’s got a reasonable sound to it, but nothing spectacular, so you my want to consider an aftermarket setup instead. I also found that I had to do an awful lot of complicated adjusting to the sound and it still didn’t hit the sweet spot for me. I also found the iPod controls to be complicated and counter-intuitive. Inside, you’ll find some of the most supportive seats you’ll ever see in a production car at this price range. 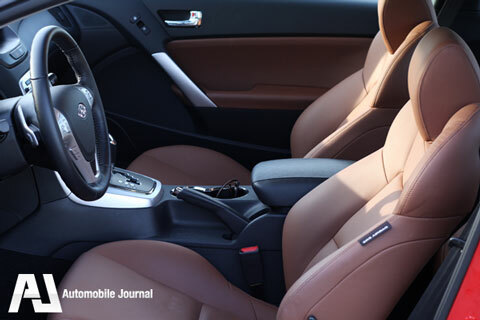 The bolsters hold you in place nicely without feeling squeezed in, and the seats have plenty of grip in them.-- a good thing given the Genesis coupe’s sizzling performance on the road. All the controls are simple and easily operated, with placement in logical spots where you’d expect to see them. You’ll find a “2.0 R-Spec” model in Genesis’ lineup, designed especially for the street racer in you. As a result, it is stripped down and loaded for bear, with items like cruise control, automatic headlights, Bluetooth and other goodies discarded in favor of strong performance on your favorite neighborhood racing facility. The Genesis coupe is,incidentally, very strong in the “head games” department. That is, it has that indefinable something that just gets to your psychologically, treating you to one heck of a fun drive in a rock solid car, with that burbling exhaust system giving you goose bumps as you head down the road. Nice. Very nice.